Virginia Mueller, age 94, passed away on Wednesday morning (January 23, 2019) after a short time at Sharon S. Richardson Hospice in Sheboygan Falls. Virginia was born March 22, 1924, the youngest of three children of Cora and Arnold Kernen. She was a lifelong resident of Sheboygan County graduating from North High School in 1942. Virginia married her high school sweetheart, Walter Mueller, on July 20, 1946 at St. John's Evangelical and Reform Church in Sheboygan. Walter and Virginia enjoyed life and we're loving parents to their four children, Linda, Walter, David and Christine. 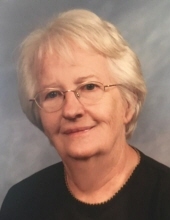 Virginia was a homemaker while her children were young, eventually returning to the workplace performing secretarial work at local employers including Kohler Company, State of WI Employment Office, Kettle Moraine Correctional Institution, and Ebenezer United Church of Christ. Virginia was a creative woman who enjoyed proofreading a local newspaper and publishing state puzzle books. She was also an accomplished author of numerous children and biblical books. A special thanks to Sandy Livermore for including her published book at the Bookworm Gardens in Sheboygan. Virginia is survived by: Children: Linda Medlin (Jerry) of Ft Myers FL, Walter Mueller (Nancy) of Fairfield Bay, AR, David Mueller (Diane) of Plymouth, WI, and Christine Simon (Reed) of Plymouth, WI. She is further survived by: 6 grandchildren, 14 great grandchildren, and a sister: Evelyn Maas. Virginia was preceded in death by: her husband, parents, sister: Marvel Gehr and nieces. She was a member of New Hope Methodist Church, Greenbush. Memorial services will be held at the Suchon Funeral Home (1317 State Road 67, Plymouth) at 4:00 P.M. on Sunday, January 27, 2019. Pastor Henry Verfuerth, Pastor of New Hope Methodist Church will officiate. Virginia will be laid to rest next to her husband at the Wildwood Cemetery in Sheboygan. Visitation will take place on Sunday (Jan. 27) at the funeral home from 2:00 P.M. until time of services. Per Virginia's wishes, in lieu of flowers, memorials can be made to Bookworm Gardens in Sheboygan. Virginia you will be missed greatly. Thanks for making our day brighter. Virginia's family would like to extend a very special thank you to Virginia's caregivers at Sharon Richardson Hospice of Sheboygan Falls. Your efforts to provide quality care and compassion to Virginia throughout her stay is appreciated. To send flowers or a remembrance gift to the family of Virginia Mueller, please visit our Tribute Store. "Email Address" would like to share the life celebration of Virginia Mueller. Click on the "link" to go to share a favorite memory or leave a condolence message for the family.